Students gather at The Rock Thursday for a vigil commemorating the victims of the terror attack in Manchester, U.K. Those who attended the vigil stressed the importance of fighting terrorism and Islamophobia. 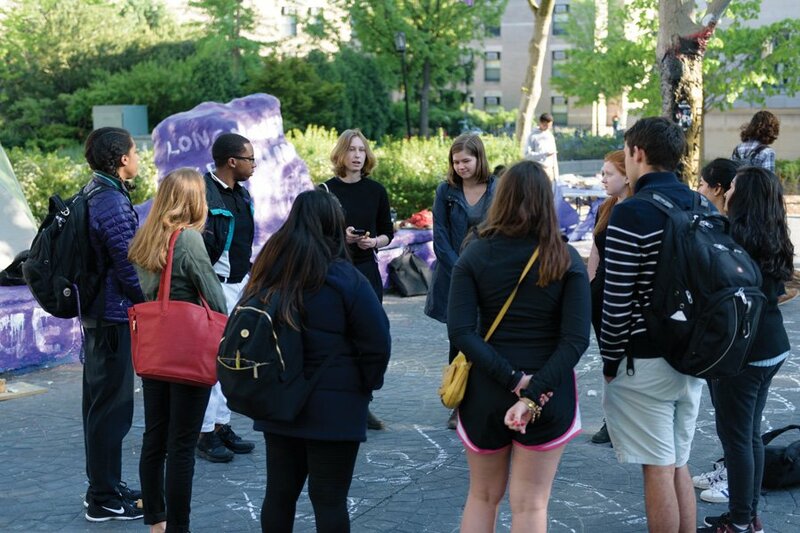 Jessica Collins, a Weinberg sophomore from London, organized a vigil Thursday to remember those who died as a result of the Manchester, England bombing this week. After an Ariana Grande concert in Manchester on Monday night, 22 people died when a man set off a bomb outside the arena. The bomber was also killed in the attack, and the Islamic State has since claimed responsibility. Collins said when she heard about the attacks, she had a difficult time processing what happened. About 10 students gathered at The Rock for the vigil, passing around a candle and observing a moment of silence for the victims. Collins and several students spoke during the vigil about why it was important for them to come together. Weinberg sophomore Numaya Shahriar, a member of the International Student Association, told The Daily she came to the vigil to honor the victims. Weinberg junior Adam Crittenden, who is also in ISA, told The Daily one of his closest friends currently lives in Manchester. Crittenden said he was initially “afraid” that she was affected by the attack. Though Crittenden said his friend was safe, her proximity made the attack more shocking to him. Collins stressed the importance of simultaneously fighting terrorism and Islamophobia. She told The Daily it’s important to talk about “common humanity” instead of using terror attacks as a weapon against certain groups. As a Muslim, Shahriar appreciated Collins’ emphasis on fighting Islamophobia, she told The Daily. “I really appreciated how she stood with the Muslim community, whereas I think many people in the world would denounce them,” Shahriar said. “It’s important that we commemorate the victims to make sure their memories aren’t forgotten and make sure that random acts of violence aren’t condoned, while simultaneously making sure that we don’t let hatred beget hate,” Crittenden said.